Tesla CEO Elon Musk says the system could be a boon to those living off the electric grid. But what does it mean for the average household? Last March investment bank Morgan Stanley reported it had been overwhelmed by the response to its recent analysis which suggested that the falling costs of both solar modules and battery storage presented a potential tipping point that would encourage huge numbers of homeowners and businesses in the US to go off grid. The 7kWh and 10kWh Powerwall are the smallest batteries in the new Tesla line. It is basically a sleek seven-inch-deep 220-pound lithium-ion battery 52″ x 34″ that can be hung inside a garage or on the outside wall of a house. 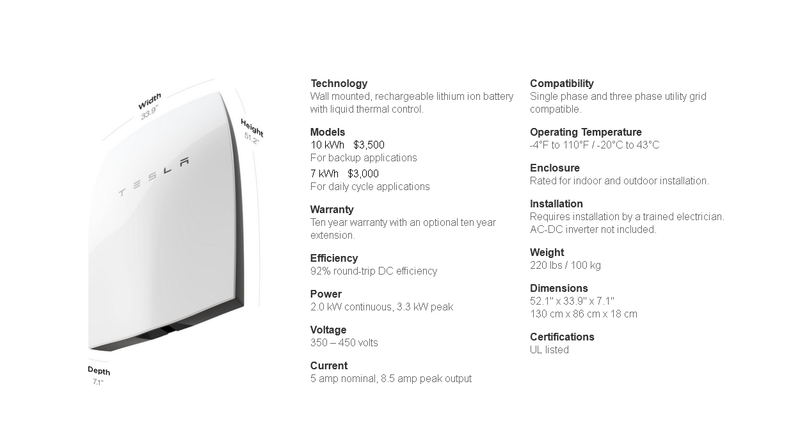 Tesla recommends the 7kWh battery for daily use and the 10kWh for homeowners who desire a backup power option. Up to 9 units can be networked together for homeowners who need more storage capacity. By my estimation, you could need as many as three batteries since the average American home uses 31 kWh a day. The battery storage units will be marketed by a division called Tesla Energy and sell for $3,000 and $3,500 each. However, the cost for homeowners will be greater since they will need to purchase an inverter and hire an electrician to install the Powerwall. What’s more likely is that Powerwall will be leased from certified distributors, that way the initial cost of using one is lower and battery replacements are handled by the company you lease from. SolarCity, co-founded by Tesla’s CEO Elon Musk, has already announced they will lease the 10kWh Powerwall for $5,000 on a 9-year contract. Additionally, SolarCity is launching a comprehensive home energy solution to Hawaiians in 2016. As jurisdictions get involved in establishing building codes for these microgrids, I expect additional expenses will be placed upon homeowners to fireproof the areas that will house the batteries. Back to the question – What does it mean for you? The answer is complicated. If you live in an area where your power company charges more for electricity during peak hours, you can charge up the battery during cheaper hours, then go all-battery when electricity costs are higher. If you already have a solar panel system in place and live in a region where power companies offer a subsidy, the new Powerwall Battery system might be more advantageous for you. For those with a solar panel system in place, the sun will recharge the PowerWall during the day and the grid will finish charging the unit at night. These homeowners will use little if any electricity during peak demand times. In some cases, they may also be able to sell excess electricity back to the grid and lower their electric bills even more. According to an article by CNN, the average U.S. household uses 943 kilowatt-hours of electricity in a month and pays 12¢ per kWh. The average bill is $115.89. With average sunlight, 3kW solar panels cut that bill in half. Depending upon where you live – in the sunny south that uses 29% more electricity than average or in the Pacific Northwest that has fewer sun days – the savings will vary. Using CNN’s figures, the average American using strictly solar panels could pay off the Powerwall in a little over 4 years. However, homeowners in the south could reduce that estimate to just under three years while people living in the northeast will need five and half years. By the way, residential solar systems are typically sized from 3 to 8kW and end up costing between $15,000 and $40,000. If you aren’t already confused by the math, let’s go back to the Morgan Stanley report for a moment. It says that for every $25/kWh reduction in the cost of Tesla’s batteries, it estimates the all-in cost of power to customers will fall by $.01-$.02/kWh, or 15-30 percent of the residential customer price for grid charges in some US states. 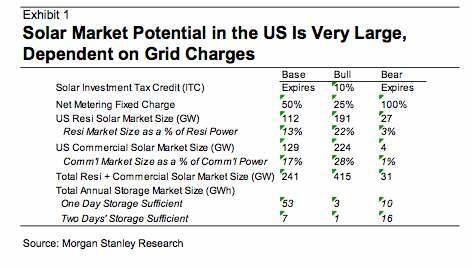 Morgan Stanley defines three potential solar consumer types in their report. The first consumer type produces more power than needed during the day, but draws from the grid at night-time. They might not use the batteries to a large extent, because the grid is effectively acting as a battery and power management system, ensuring customers have power when they need it. 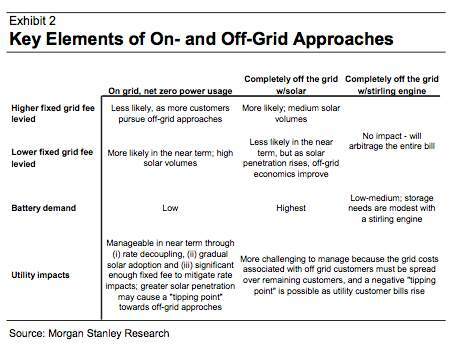 However, Morgan Stanley says this will likely push up bills for remaining utility customers, creating more “rate headroom” for off-grid approaches. The second consumer type is using no grid power, even at night, but has the ability to seek emergency grid service in the event of a special circumstance or home system failure. It would likely, Morgan Stanley says, cause the utilities to set a high emergency access fee, providing further incentive for customers to go fully off-grid. The third group of consumers are completely off-grid. Customers choose this approach because grid access requires a large non-bypassable, fixed-grid charge. Whether they use solar panels or other elements such as wind, the key is the cost of power storage. Tesla’s $5 billion Gigafactory for battery production, given it could reduce the cost of batteries from $300/kWh to as low as $125-$150, would make using the grid as a back up battery no longer attractive. Furthermore, if utilities continue to resist the “distribution” model that Tesla outlines for delivering electricity, and hang on instead to the centralized model, then as more consumers are burdened with long system interconnection delays and increases in capital expenditures, utilities risk mass customer defection from the grid. As interest builds for renewable and alternative energy sources for the home builds, Tesla and its vertical companies are placing themselves in potentially strong positions. While I don’t expect Tesla Energy to have the battery storage market to itself, of course. Other major battery makers like LG Chem and Toshiba will surely compete for market share. The one thing we can be sure of is that the traditional way of making and distributing electricity is going to change. Perhaps In a few years, we will see more renewable energy distributed over microgrids rather than electricity produced by burning coal or natural gas distributed over vast regional grids. Thanks, Helen. I had no idea how involved the post was going to be when I started it.